Living legend Steve Wozniak has already commented about the way the new Jobs movie screws up the actual relationship between him and Steve Jobs. The Woz, in a series of comments related to the release of the theatrical trailer for the movie, said that he has a suspicion that Jobs will be portrayed as a saint. 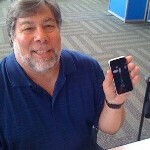 Wozniak made it clear that in the early days of Apple, a saint Jobs was not. It wasn't until his return from exile (or NeXT) when the more older, more wiser Steve Jobs "came back as the saint and god we now recognize and did then head the creation of other products as great as the Apple ][, like the iTunes store, the iPod, the retail stores, the iPhone and the iPad." The Movie will open in theaters on August 16th and starts Ashton Kutcher (whose current television gig has him ironically playing an internet billionaire) as Steve Jobs. And while you can see Kutcher through the makeup, there are times when you'd swear that it was Jobs himself. Josh Gad takes on the role of Steve Wozniak and the film focuses on the two Steve's building up of Apple, Jobs' subsequent dismissal from the company, and his triumphant return. "I have a little bug in me that says that this movie will portray Steve as a saint who was ignored, rather than one of the key people who led Apple through failure after failure (Apple ///, LISA, Macintosh) while the revenues poured in from the Apple ][ that Jobs was trying to kill. It's nice to have the luxury to fail. The Macintosh market was created in the 3 years after Jobs left, with a lot of effort, by some who Jobs disdains. Jobs came back as the saint and god we now recognize and did then head the creation of other products as great as the Apple ][, like the iTunes store, the iPod, the retail stores, the iPhone and the iPad. But he was a different person, more experienced and more thoughtful and more capable of running Apple in those later years. Wozniak does complain a bit that a character like John Sculley was made to look "sleazy" which The Woz called "an exaggeration." i love Woz he's like a big cuddly teddy ! and don't you hate it when movies ruin things for drama ! :( Oh well it's hollywood, what can you do ?